Linda reports, “ They are catching walleye and northern pike and a few bass. The weather was cooler this week. The bite has been good one day and hit the next this week. Cranks have worked well in 15 to 20 feet depths of water. Leeches are working. Small mouth bass are still at rocky points and underwater cliffs. Water temperature on the surface is 71 degrees..
Stephanie says,” the water temperature is cooler. The water is going down some. It seems to be getting a little better. One crappie caught was 1 ½ pounds less than the record and 1 inch off and less than the record. Some are catching walleye, but most are smaller. They are just not getting as many. Fishing is just okay. The cleaning station is finally open. “ The water is definitely warm. The walleye and northern pike are hitting less. Fish in the early morning and late almost at sunset. Try a mister twister, “ Glennis says . Bob says,” There are people catching fish. The osprey are active so there are fish out there. In the last couple of weeks they did stock some more rainbows. The Big Horn is the big news right now. They are saying it will be going down 5,000 cfs daily. They are taking the water down and are saying that by the end of the weekend it will be down to 3000 cfs. They are starting to match inflow with outflow. Taking the water from the bottom to the top of the lake. That will change the temperature and make it come down a lot. The water has just bbeen to hot so that will make the fish more active. Strangely with the water being high the fishing has still been good. Scott said, “ I fished Devil’s Creek and at Forchette and the walleye is slow. We caught 1 12 pounder. Not much more than that. Achley Fishing is good and successful trolling at 2 aand a half miles per hour using a rapella. . The fishermen are starting to catch tiger muskeye from the bank and from a boat. They are catching rainbows with night crawlers. At Spring Creek fishing is good from the bank. It has been steady with people catching a steady 15 to 20 fish. Strangely it is happening at 11 am to 3 pm the hottest time of the day. Using a immersion method also works. It is crystal clear. Bead head nymph fishing is good. The ponds have mossed up. “ Trout fishing was again really good this week. Go deep and cool. It is good all over. Perch are being caught at 20 feet depths and and excellent . The have been catching some really nice perch and it has been excellent fishing. Lots of them from the boat. The walleye fish they are catching are 14 to 18 inch size. They are finding them in the river. They are using bottom bouncers and crank. Everyone is consistently going south toward pond 1, don’t forget the Camp-mak-a-dream walleye benefit that is this weekend. You can sign up from Wednesday evening on, It is a family friendly event. Come and enjoy the fun, “ Sharon tells us. Jim says,” Nelson is now low. On Sunday when I went the one tire was off the ramp. It is not bad yet just be watchful. Irrigation is due to be shut off on the 10th . It can be tricky getting off and on. Fishing was really good for walleye but smaller ones. We were using bottom bouncers with a worm at 15 to 20 feet. The fish are going deep. Yellowstone: The Yellowstone River close to Billings is clear. Going East they are catching some small mouth bass and sauger. Use a minnow imitation. Some caught a 6 pounds and 5 pound sauger. That was near Huntley. Fort Peck At the dam people are saying they arenonly catching a few salmon. They say it has pickedup a little.Try cranking 144 feet deep and catching a ton of walleyes. 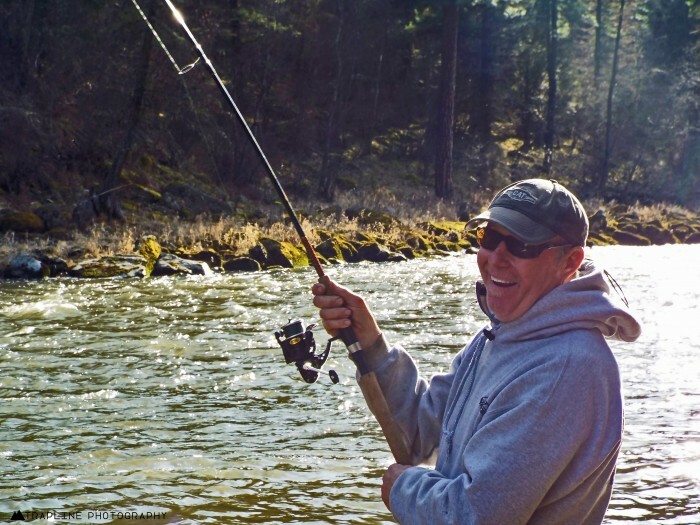 Tongue-On Tongue: I am hearing fishing is okay. They are catching some smallmouth bass in the trees . The fishing is better in the morning and evening. Yellowtail: Those who went to Yellowtail and got a few small mouth. They were using tubes and wacky worms to catch them. Sometimes the orange colors are working well. Tongue : Reports on Tongue is it is alright fishing. The water is hotter. They are catching large mouth and small mouth. The guys were using plastic worms. Rich says, “ The walleye are biting on Canyon Ferry. I am hearing Canyon Ferry is pretty good fishing. They are catching rainbows, walleyes and some perch using bottom bouncers aand a few cranks..
Hale says ,” The good news is the water has gone down to 4350 cfs. The water is 65 degrees right now. There is more wade fishing. There is aquatic grass in the water and it is a factor. There are tricot hatching in the morning at 7 to 11 am. The fishing is good. Nymph fishing is working. Try a Ray Charles, sunken tricot pattern or the sow bug or a black PT. PMDs hatching early have had some selective trout rising. The nymph bite has been good with PMD patterns and smaller dark caddis patterns. Warm summer days have seen trout eating hoppers in the afternoons. Keep those fish wet!